Wildlife poaching in zoos(!!!) is a serious problem! Incredible. The security guards were on dinner break. 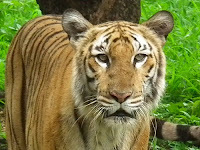 Apparently suspects have not yet been found in this tragic killing of a tiger in a zoo in India.